Hey everyone! 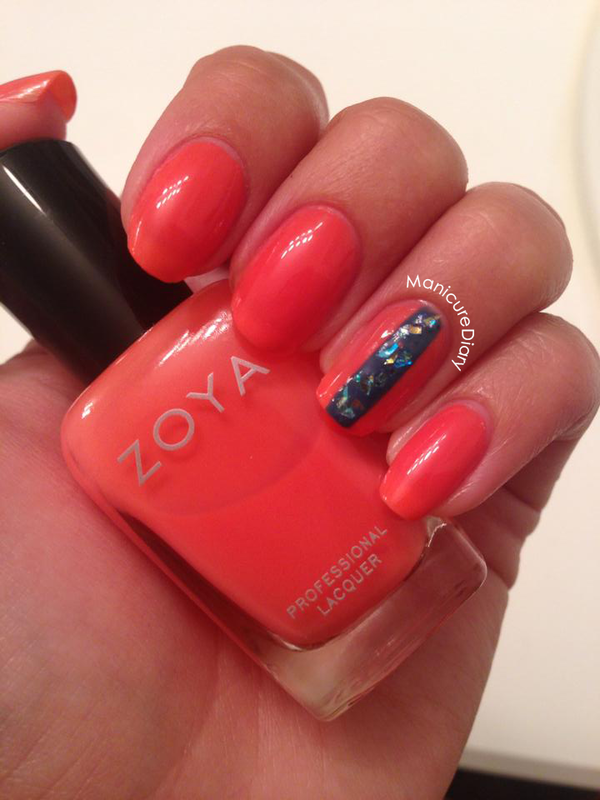 I'm excited to show you this gorgeous coral polish named Maya from Zoya. I ordered it during Zoya's "THREEDOM" promotion. Click here to check out that post. 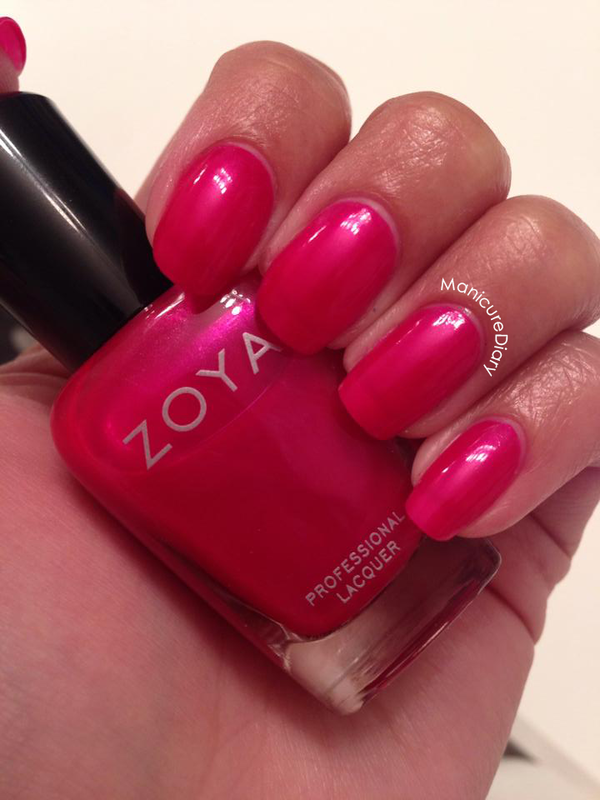 Maya is described by Zoya's website as a "semi-opaque bright pink coral with tangerine undertones. 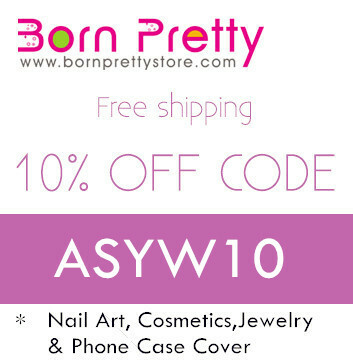 A bright tropical coral for a translucent jelly-like finish on your manicure or pedicure." 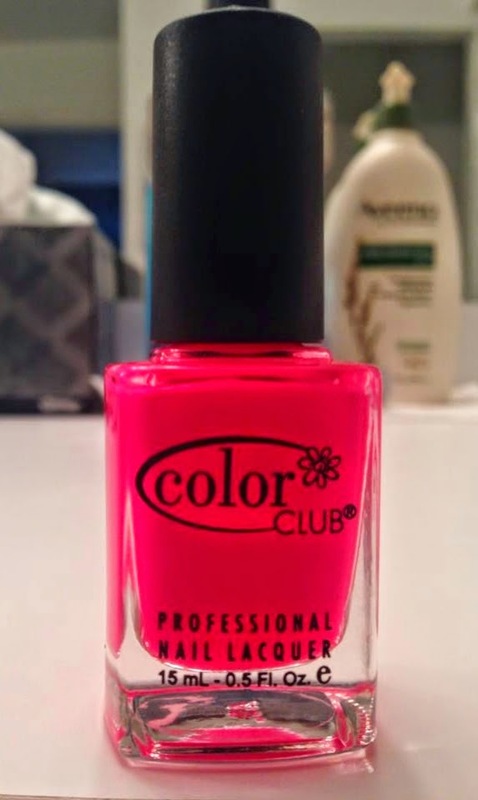 I loved this color so much that I actually used it on my fingers and toes, which is not something I do often. For that stripe accent I used my new striping tape. You can find packs of striping tape at low prices on Amazon. The other tool I recommend that you use with your striping tape is a pair of tweezers. They really come in handy for removing the tape from your nails quickly. As you can see, the striping tape is teeny tiny! Once you get the roll started, use some sort of place holder because it can be difficult to find the edge. I just folded up a piece of tape and stuck the end of my striping tape to it. Remember to wait until your base color is completely dry before you put your tape on and to remove the tape quickly after you polish over your design. 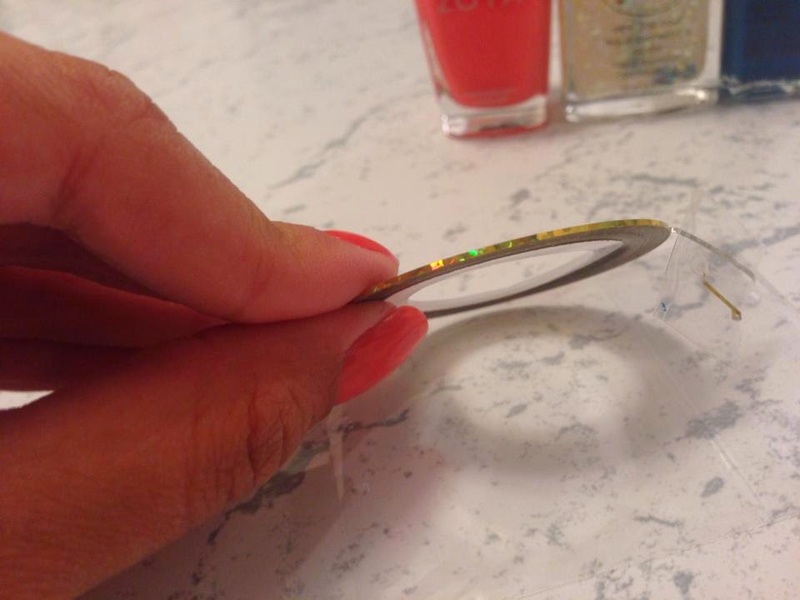 If you wait too long the base color will lift up with the tape. If you are just starting out, the key to striping tape is patience! It may take a few tries but you'll get the hang of it. Hey everyone! I spent the weekend in NYC celebrating my boyfriend's birthday. 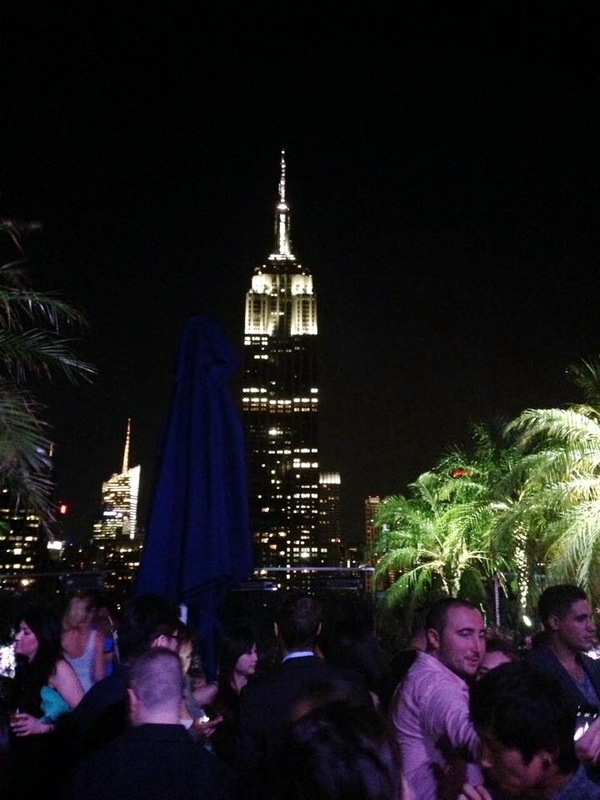 We went to a rooftop bar with a gorgeous view of the Empire State Building and had dinner with his family at Max Brenner! If you haven't been to Max Brenner, definitely go. They have the most delicious desserts. Here is my manicure from the weekend (Zoya Brooke - my namesake polish) and the amazing view from the bar! 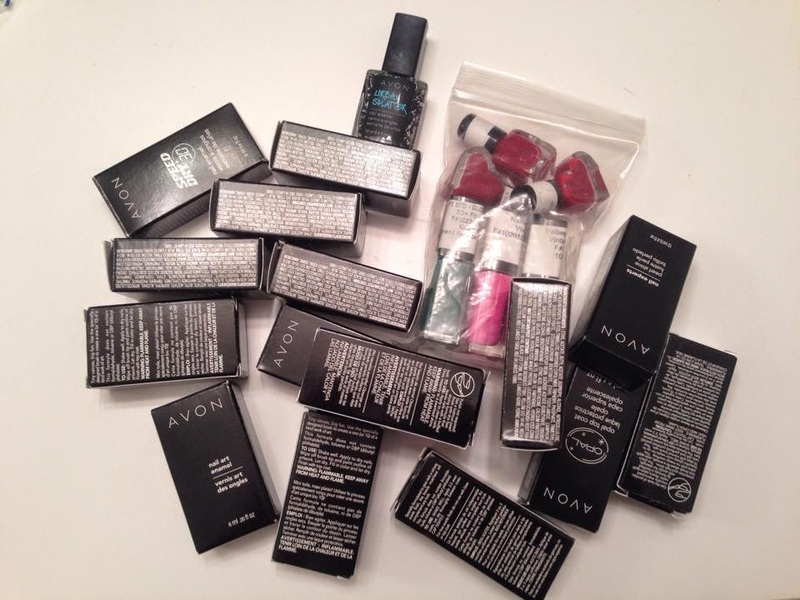 My friend who works at Avon came out to the bar with use and she hooked me up with a bag of goodies that I am so excited to try. These are special toppers, Opal and Urban Splatter. Opal looks beautiful! These two sets were samples with no labels. How cute are those heart bottles?! 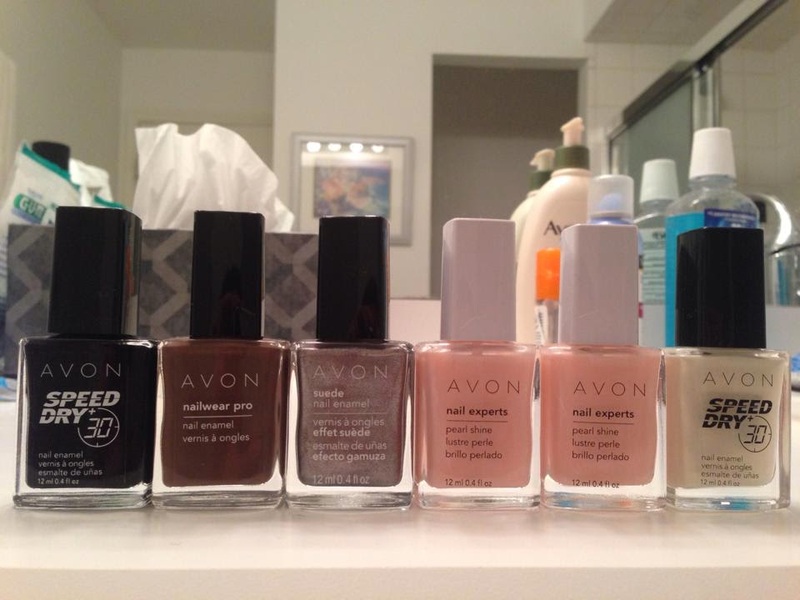 I can't wait to play with all of these new polishes, especially since I've never tried Avon before. Now I just have to decide which colors to use first! Hey everyone! 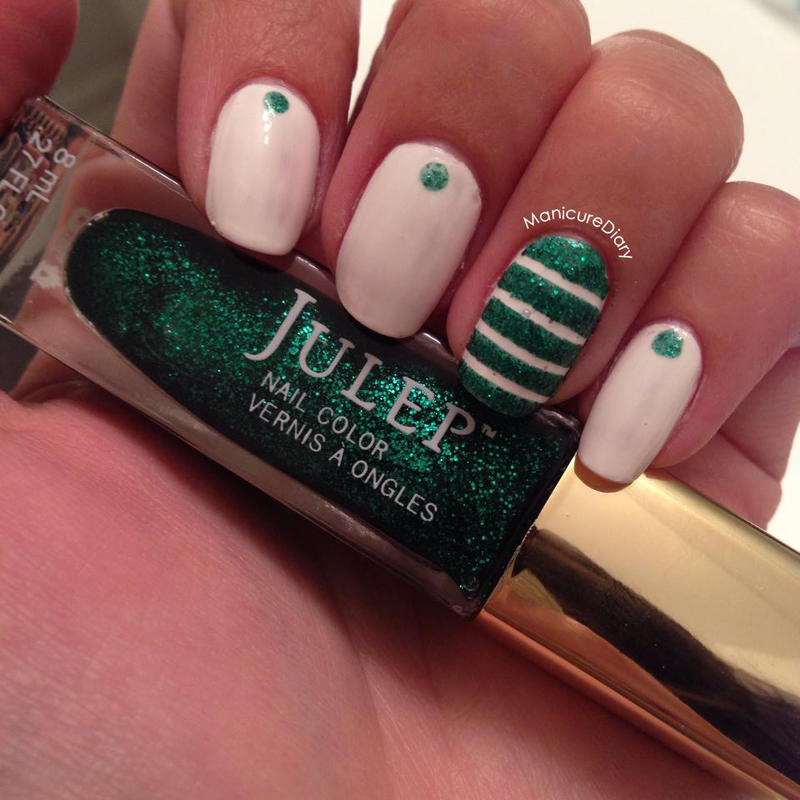 Tomorrow is spirit day at the day camp I work at and our colors are green and white, so I decided to do a fun mani. I just got some striping tape and I absolutely love using it! I thought it would be really difficult but it's actually pretty easy to use. Next week I'll do a striping tape tutorial so you can see how to achieve this look at home! 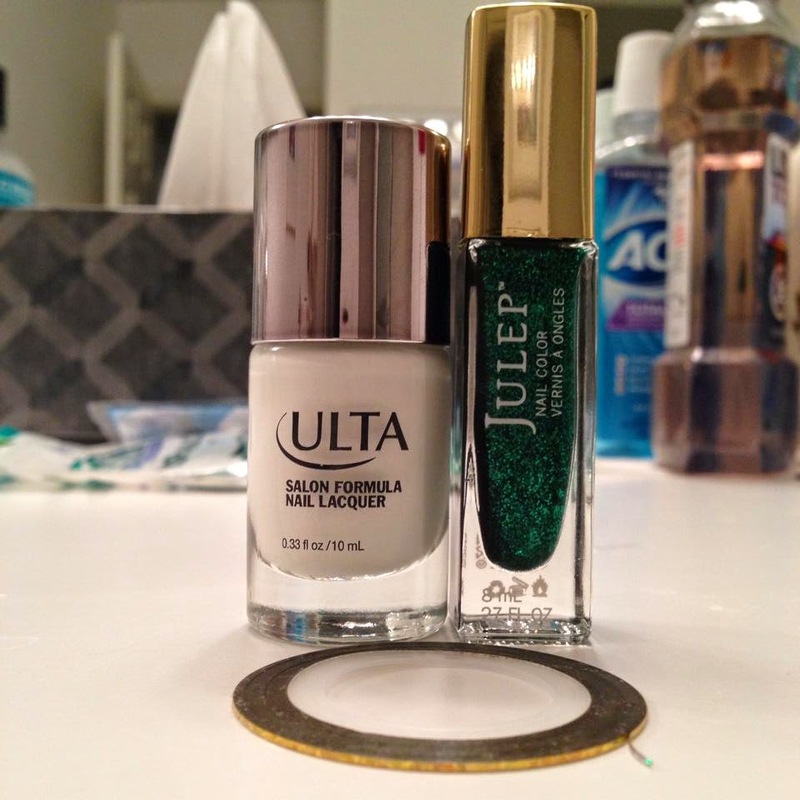 Here are the colors I used: Julep Priscilla & Ulta Snow White. 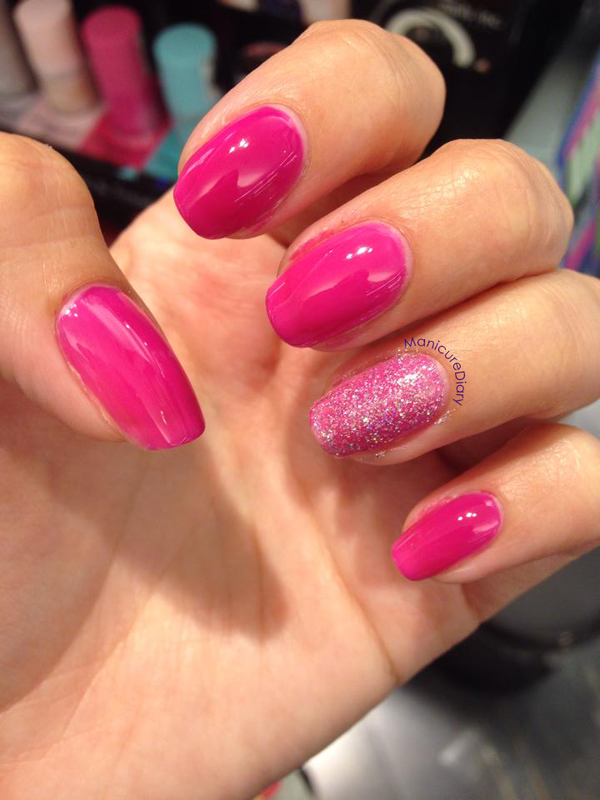 Priscilla is from the Julep Birthstone collection, which you can check out by clicking here! Hey everyone! I finally got my "THREEDOM" order from the Zoya promotion in the mail. I ordered these around July 4th. 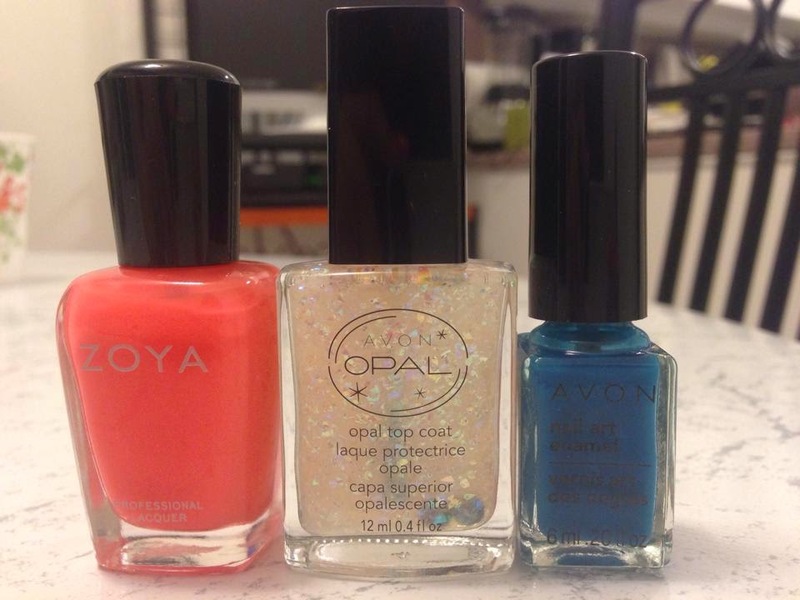 The deal was for three free Zoya polishes, just pay $12 for shipping and handling. 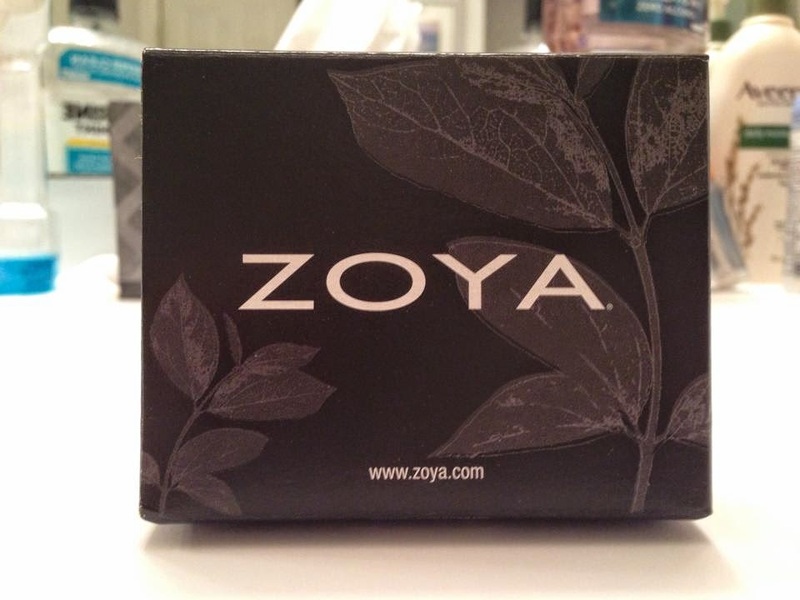 All three polishes came in this cute little box. And here are the three colors I chose. 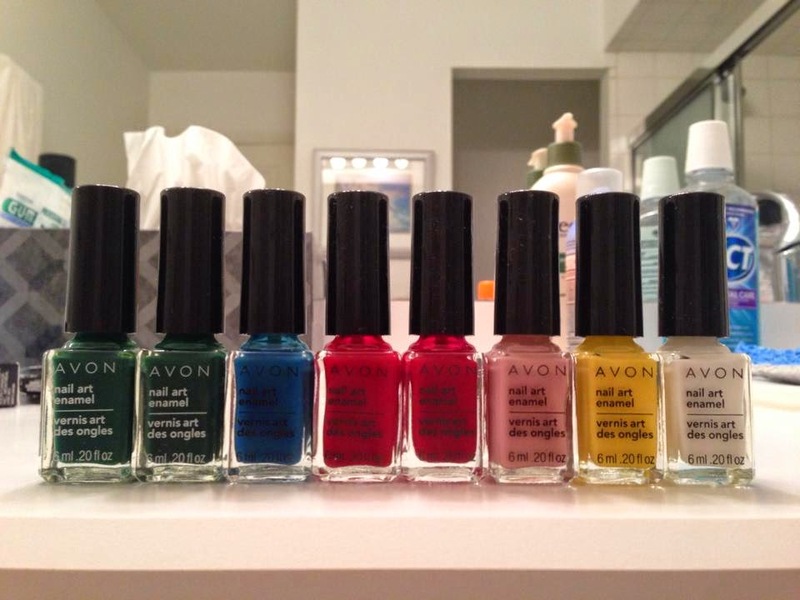 I'm so excited about these gorgeous colors, especially Brooke (my namesake polish!) I absolutely adore Zoya nail polish. The formula is always smooth and the colors are just gorgeous. I hope to continue adding this brand to my collection because I think they are some of my favorite! Hey everyone! I'm back from the beach and I had such a relaxing weekend. My manicure didn't hold up too great with all of the beach activities so I was very happy that I brought the polish with me to do touch ups. Now that I'm back it was time to change up my mani! I was at Marshalls today and scored a bottle of Essie Rock the Boat for $4.99! Here it is with a fun accent nail. I wanted to make flowers but they kinda look like fried eggs haha! 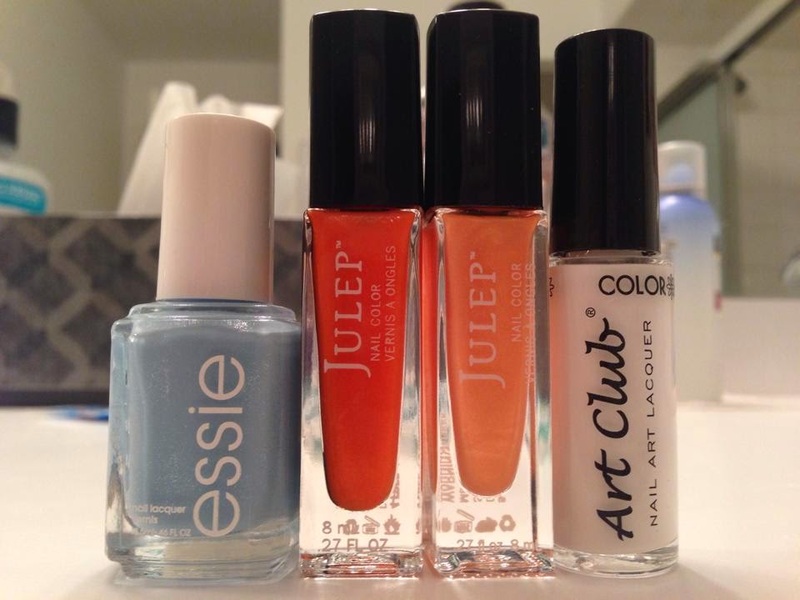 Here are the colors I used, from left to right: Essie Rock the Boat, Julep Marjorie, Julep Saaya, and a Color Club White nail striper. Hey everyone! Just a quick post before I head out for the day. I'm so excited because I'm going to be spending the next three days at the beach! Whenever I'm going away for a few days I like to choose one color for my nails and then I take that color with me in case it chips a little. If it's a longer vacation I'll take a small bottle of remover, a couple of colors, and my base and top coat. Since I'm only going to be away for the weekend I chose Color Club Jackie OH! It's my absolute favorite summer color, especially on the beach. I have it on my fingers and toes. To see my previous post about Jackie OH! click here. Hey everyone! I have a quick mani to share with you tonight. 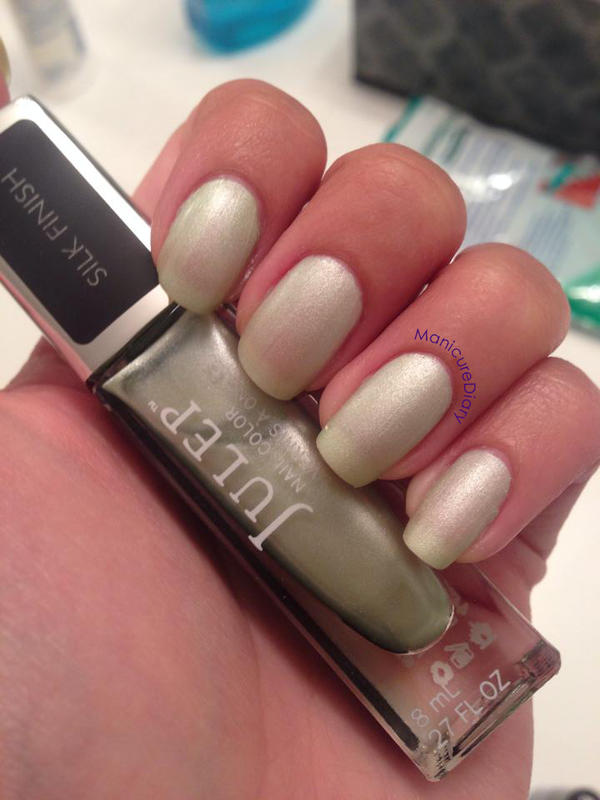 I finally used Julep Shannon, which is described on Julep's website as, "spring honeydew silk." It was released in March as a part of a "Lucky Mystery Box," although I got it during the Red Marker Sale. Shannon is one of their silk finish polishes and it looks like this without the top coat. In the future I would probably use three coats instead of two since I can still see my nail line. I absolutely love this color and I think the satin finish is beautiful. I did decide to use a top coat just to see what it would look like. I also added a little glitter accent using Rainbow Honey The Soireé. Here are the colors I used: Julep Shannon & Rainbow Honey The Soireé. 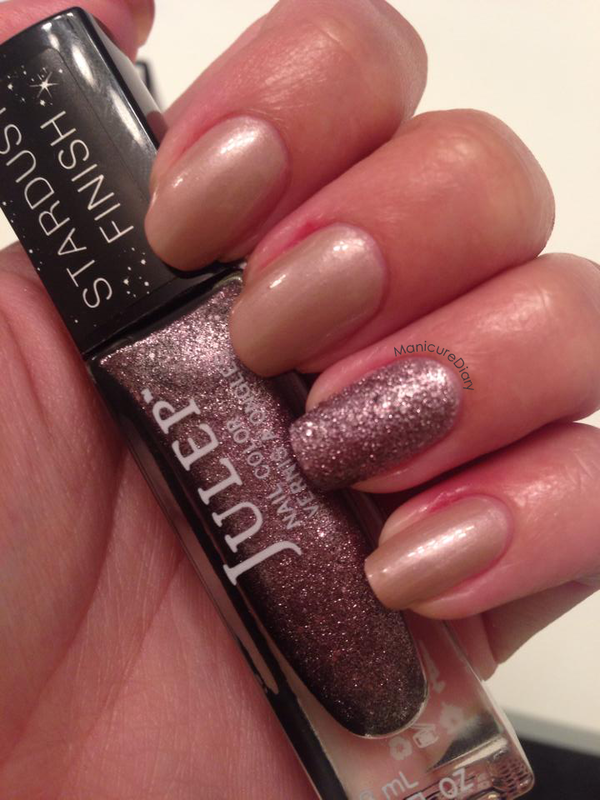 If you'd like to check out all of the beautiful polishes Julep has to offer, click here! They have a ton of gorgeous and unique colors. Hey everyone! Have you ever used a polish that left you with stains on your nails? Recently I used the color Jolt from Sinful Colors and it left me with blue stains. There is an easy at home fix for this problem. 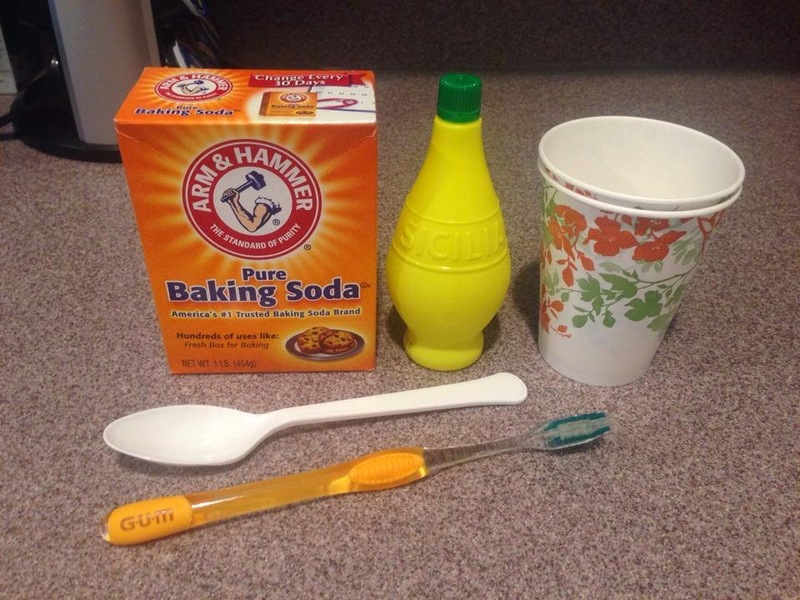 The supplies you will need are baking soda, lemon juice, and warm water. Let's get started! Step one: Fill a cup or a bowl halfway with warm water. I just used a paper cup so I wouldn't have to wash out a bowl. I'm lazy! Step two: Measure out two tablespoons of baking soda. I used a plastic spoon for measuring and mixing. Step three: Add one tablespoon of lemon juice. Your mixture will fizz up a little, which is why you should only fill your cup halfway so it doesn't spill over. Mix everything together. Step four: Dip your nails into the mixture and let them soak for about a minute. Then, use a toothbrush to gently scrub each nail. You can use your fingers for this too if you don't have a spare toothbrush around. Step five: Repeat steps one through four and then wash your hands. 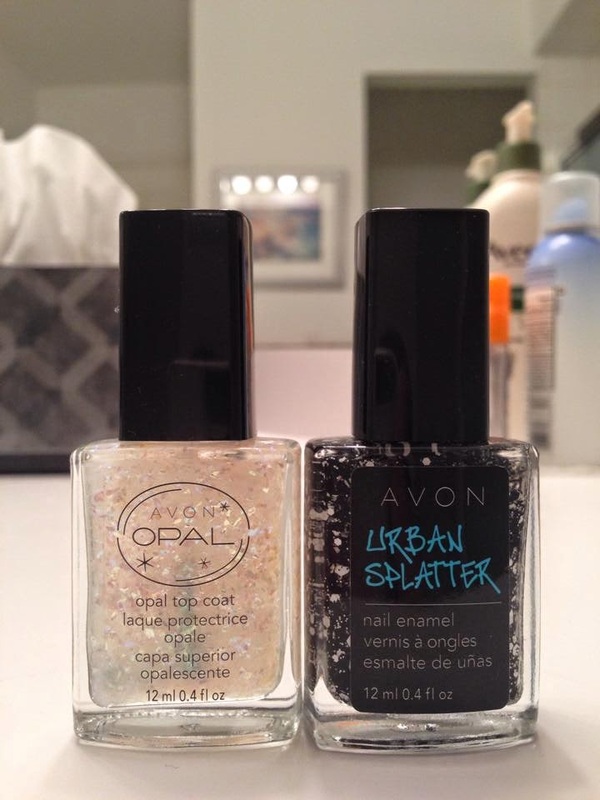 Your nails should be free of stains! Hey everyone! I'm so excited because tomorrow night I'm seeing Beyoncé and Jay Z! Of course I had to do something fun with my nails. 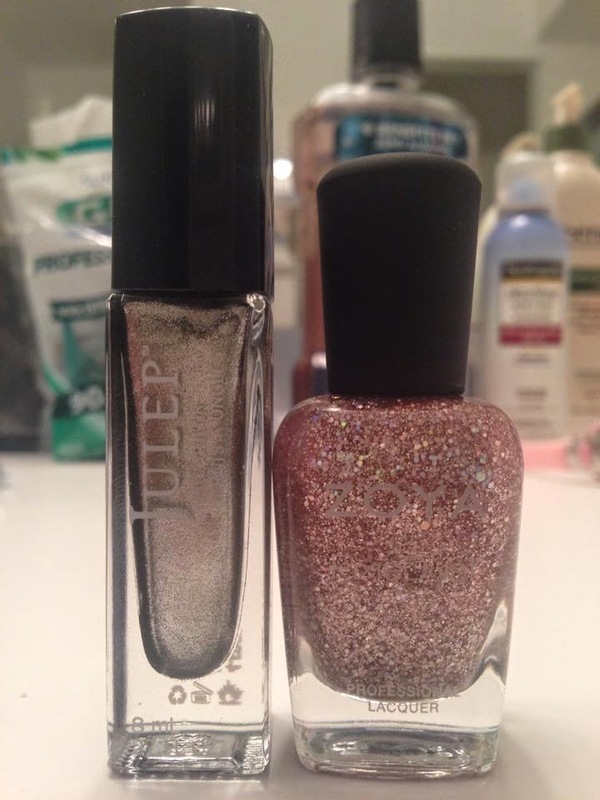 I knew that I definitely wanted to use Julep Empire, a limited edition silver polish that was made just for the pop-up Julep store in NYC back in December of last year. I decided to use Zoya Lux as a gradient accent and a silver stud on each ring finger. I think my nails are definitely ready to party! Hey everyone! 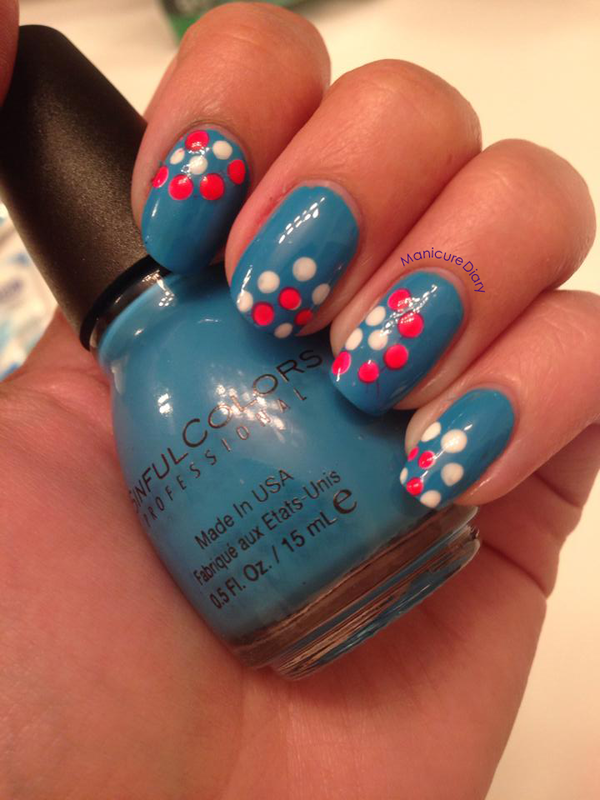 I have a fun dotticure for you today. I used Sinful Colors Jolt, which is a bright blue creme. For the dots I used Ulta Snow White and Color Club Jackie OH! 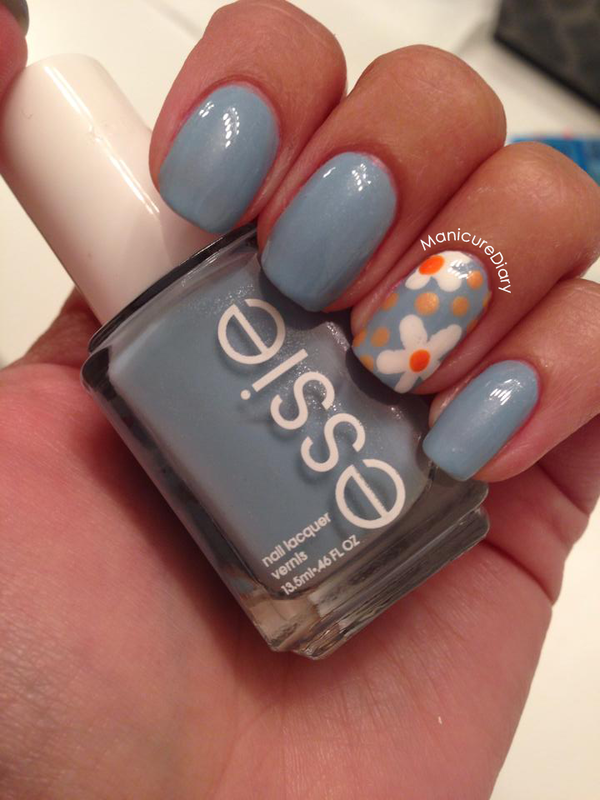 I love this combination for summer and can't wait to try this dot design with other colors. I definitely need a little more practice with the dotting. 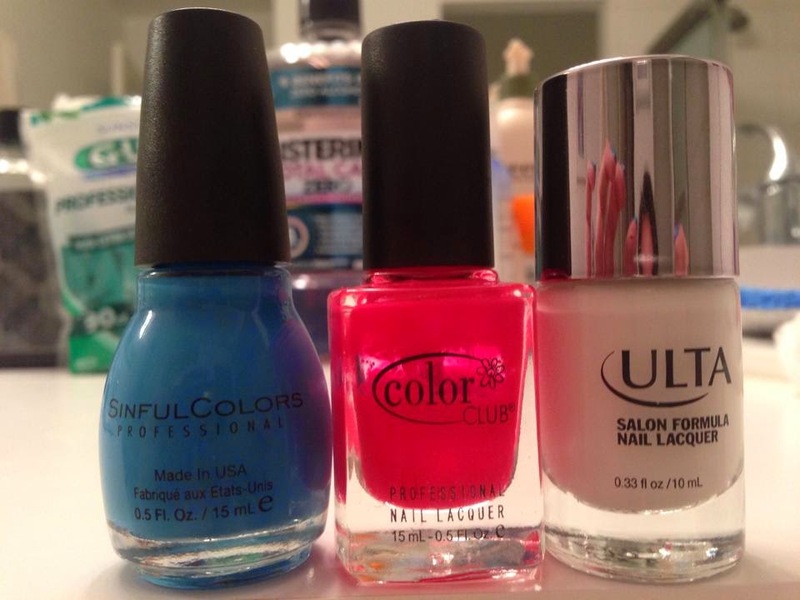 Here are the colors I used, from left to right: Sinful Colors Jolt, Color Club Jackie OH! and Ulta Snow White. 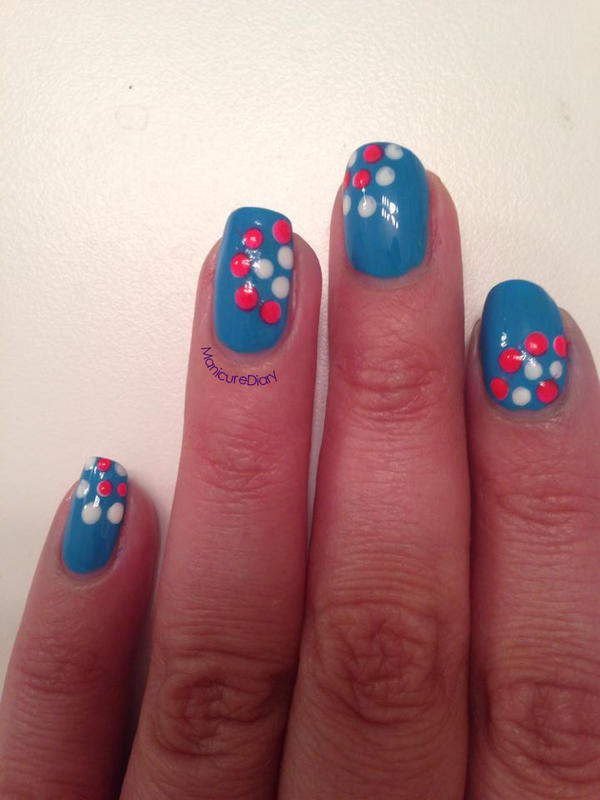 For the dots you can use a toothpick, a bobby pin, or anything that will make small dots. I use my Julep Plié Wand with the dotting tool attachment. It takes a little while to get the hang of dotting. I like to practice on a piece of foil or wax paper before I place the dots on my nails. Make sure you wait until your nails are completely dry so your design doesn't smudge. Happy dotting! Doing My Nails at Sephora! Hey everyone! I just got back from the mall where I had dinner at Cheesecake Factory with a couple of friends. In case you ever go and want to try something new, I love the white chicken chili. It's on their "Skinnylicious Menu," which means I can feel a little less guilty about eating the cheesecake (only a little). A trip to the mall is not complete without visiting Sephora! I went in with bare nails and came out with a pretty fabulous manicure. I just can't resist their nail bar! 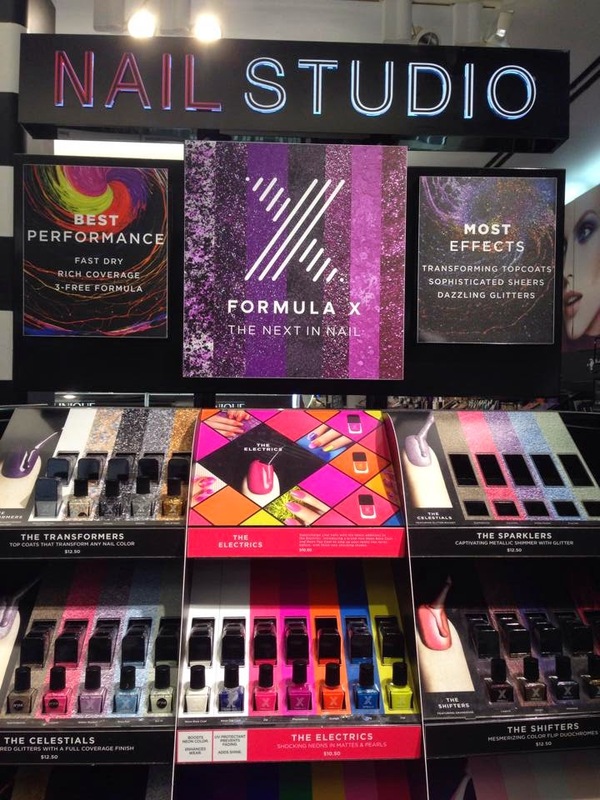 I chose two polishes from the Formula X line. My main color is Phenomena from The Electrics collection and the accent nail is Fine Like Einstein from The Brilliants collection. If I were to purchase a color from The Electrics in the future I would definitely use a white base underneath to make it pop. Plus with two coats I was still able to see my nail line. Fine Like Einstein is a seriously gorgeous glitter bomb that I will be purchasing! I absolutely love it. I have to admit I'm pretty proud of how my mani came out considering I did it super fast while standing at the display! This is how it looks pre-cleanup. I topped it off with a Deborah Lippmann top coat since it was the first one I saw. Before leaving the store I had to double check the sale items and I was so excited to find a polish I've had my eye on for a while! It is the Formula X Cherry Blossom and I picked it up for $6.00. Too bad I didn't have it for when I went to the Cherry Blossom Festival a couple months ago! 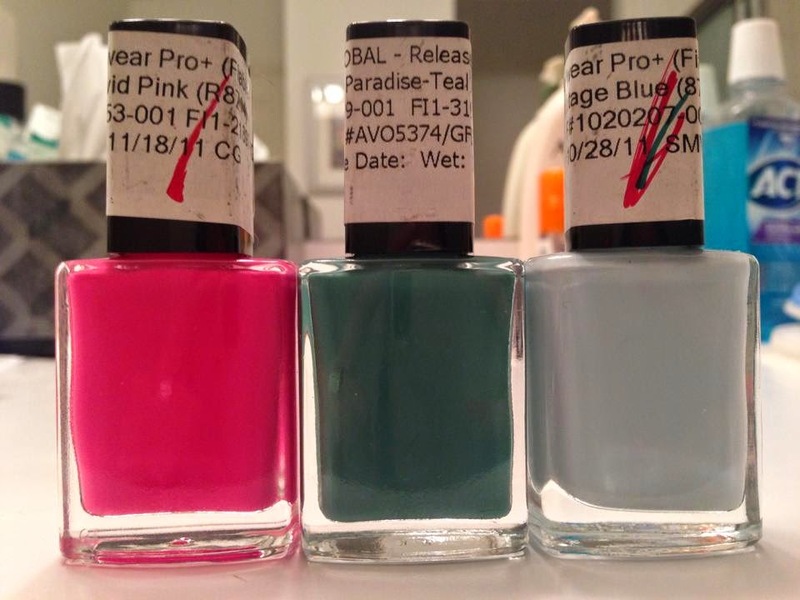 Don't be afraid to test out the polishes when you go to Sephora! They have the tester bottles out so you can experiment and find the perfect color. Hey everyone! Although they are tiny details in the big picture, your nails are actually an important part of your interview outfit. Chipped nail polish is a huge no-no, as are crazy designs or neon polish. When it comes to your nails for an interview, or even at work if your office has a strict dress code, neutral colors and clear polish will be your best friends. 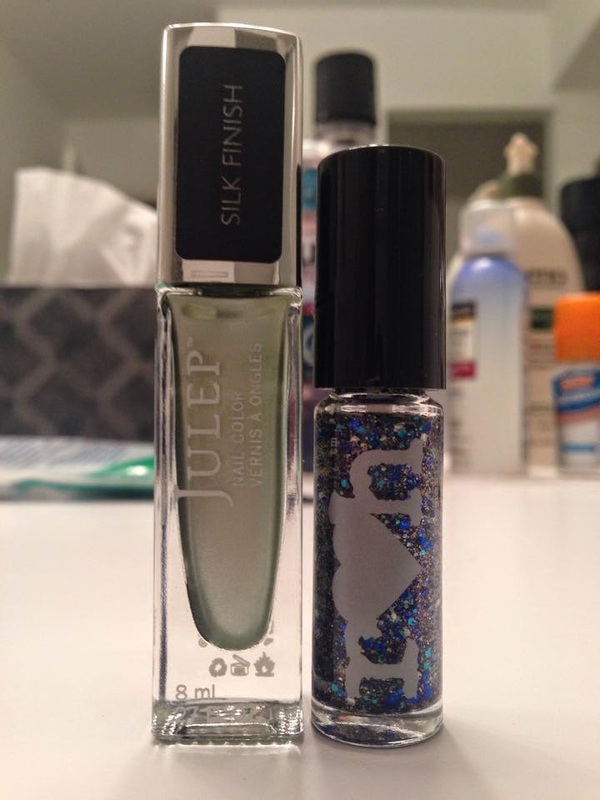 My go to when I want my nails to look clean and polished is the Oxygen Nail Treatment from Julep. 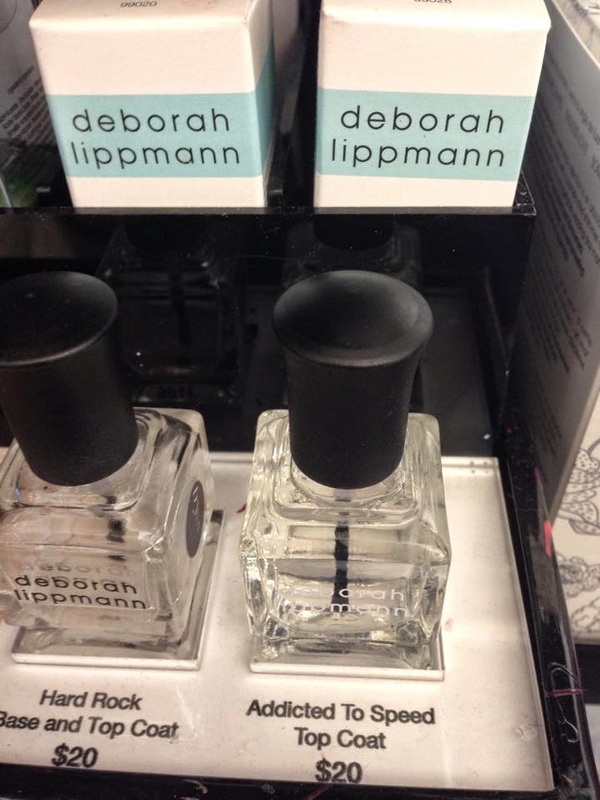 It is described by Julep's website as "complete nail care and make-up all in one bottle." 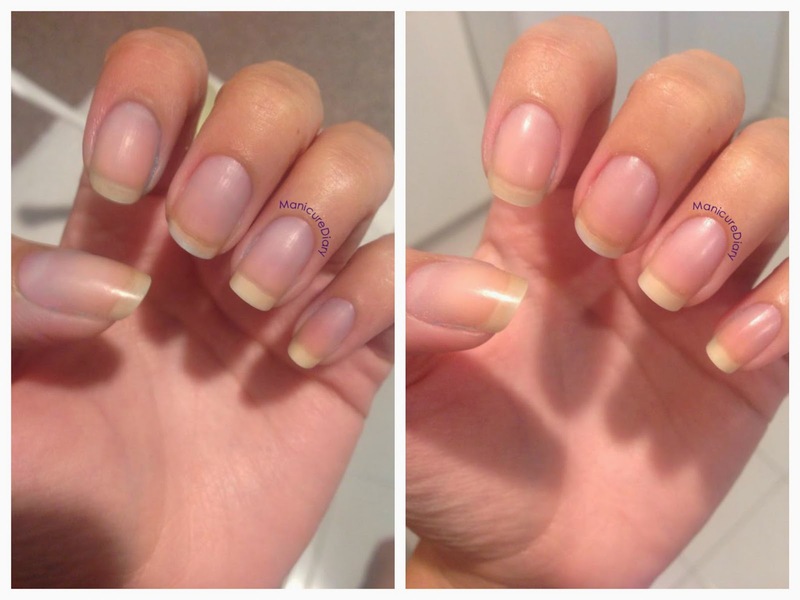 The formula is supposed to improve the condition of your nails to make them less prone to breakage and splitting. I love how this treatment is slightly pink but still clear and makes my nails look so healthy. I always wear this for interviews because I know it will not distract the person conducting the interview from the main event -- me! Hey everyone! Hope you all had a wonderful Fourth of July and that you continue to enjoy your weekends. The weather here in New Jersey is beautiful and I know I'll be spending lots of time outside! 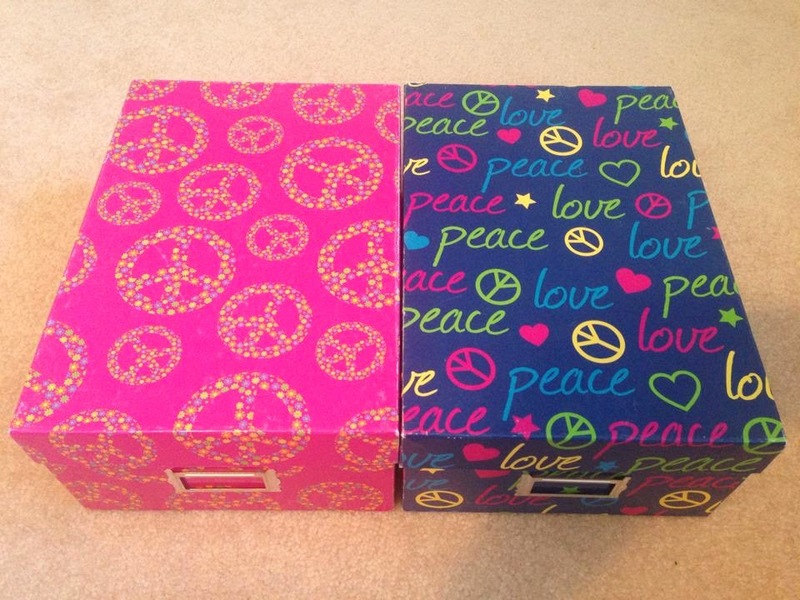 Today I'm sharing with you my current storage system for my polishes and supplies. 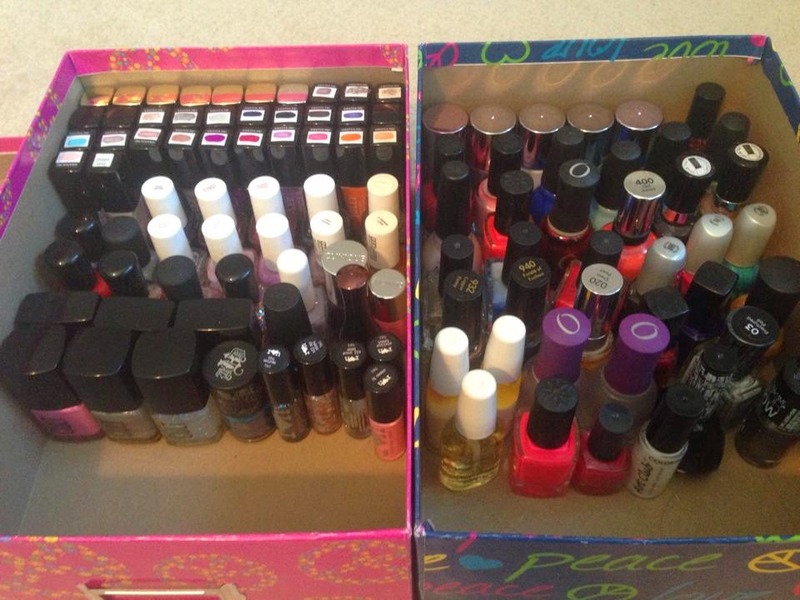 I currently have around 100 bottles of polish that I separated into two boxes, one for my drugstore polishes and the other for my more expensive polishes. I think I picked these up at Christmas Tree Shops, but I'm sure you can find them at Target, Michaels, AC Moore, etc. Can you tell that I love peace signs? High end polishes on the left, drugstore polishes on the right. 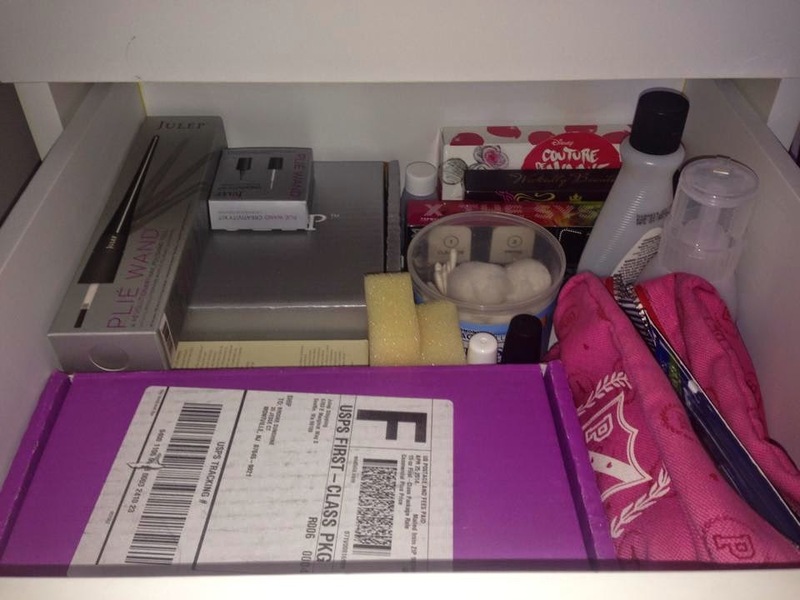 I keep all of my supplies like nail polish remover and special edition nail polish sets in one of my drawers. I also keep my top and base coat in there so I always know where they are. So far this system has been working great for me, but as my collection continues to grow I may have to look into changing up my storage. Hope this helps anyone who isn't sure how to organize or store their polish! My best advice would be to store your polish standing up to avoid any spills. Hey everyone! I have a very quick post for you today because I have a wedding to finish getting ready for! Just thought I'd share what I did with my nails. I wanted them to look classic with a bit of sparkle. 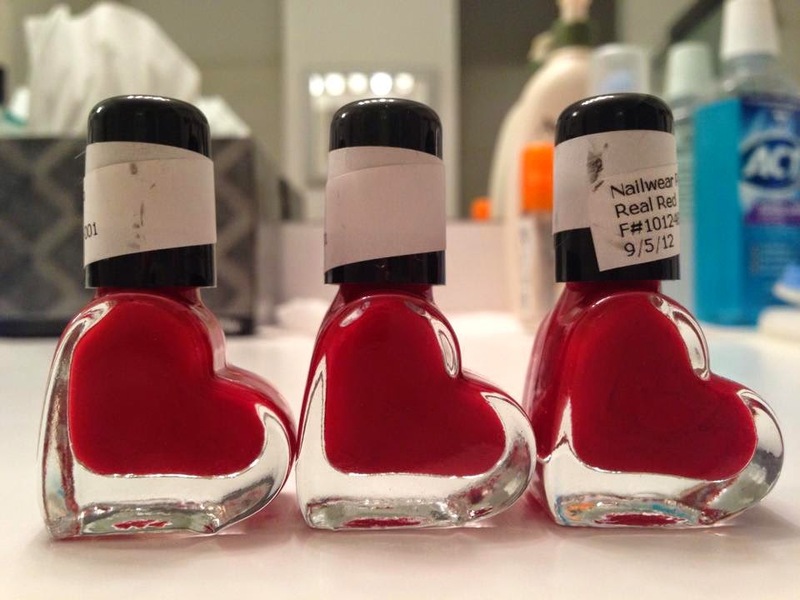 I actually just got these colors in my Julep Red Marker Sale order. 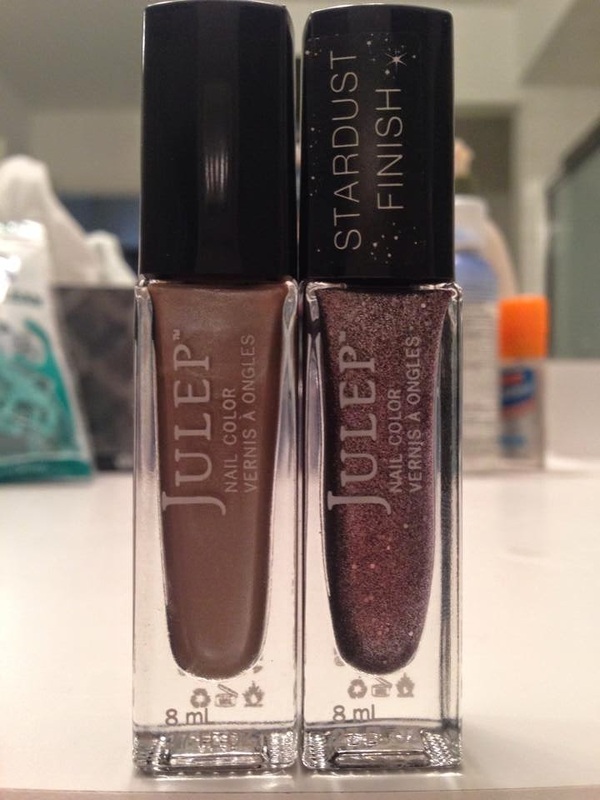 Click here for the link to that post and click here for my post to learn all about Julep. 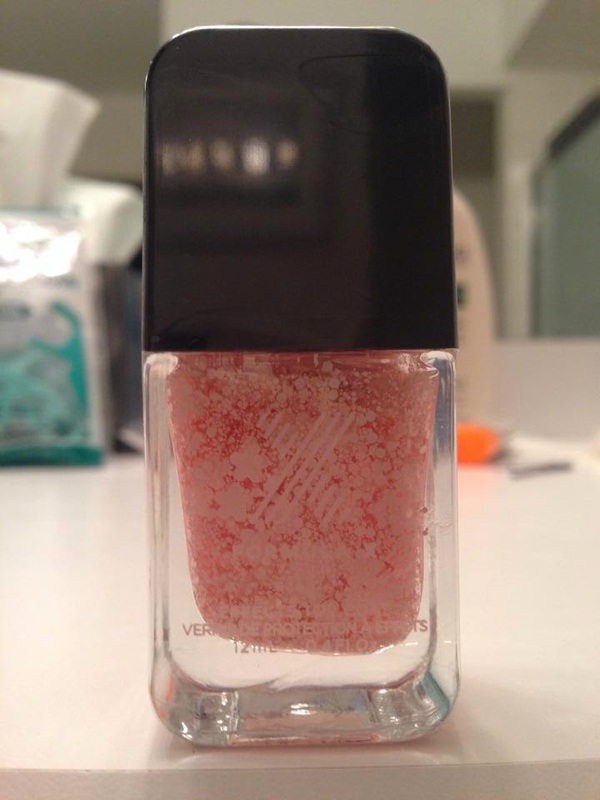 The main color I used is Lois, described by Julep as a "dusty rose frost." 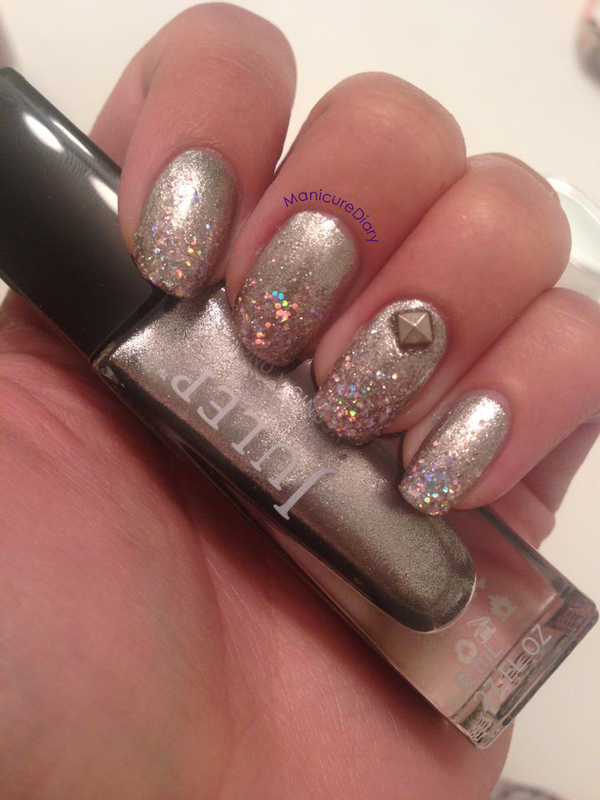 My accent nail was done with Cameron, described by Julep as a "silver lilac stardust (matte glitter)." I absolutely LOVE Cameron! It looks so pretty and sparkly in person. I'm so happy with how this combination turned out.